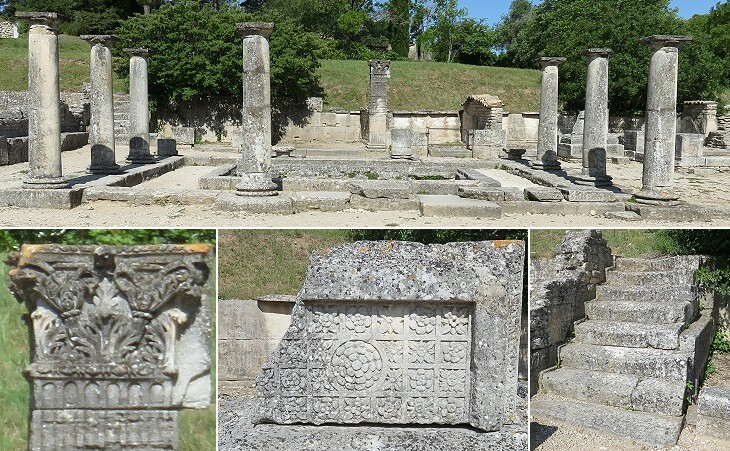 You may wish to see an introductory page to this section or a page on the Arch of Glanum and the Mausoleum of the Julii first. 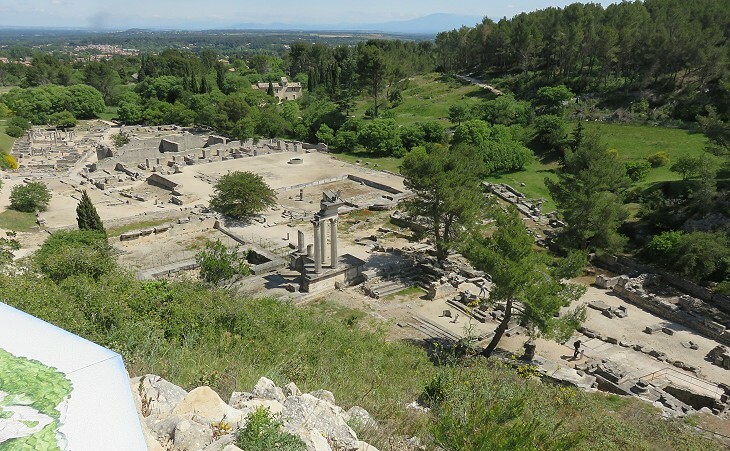 The first excavations of Glanum began in 1921 in a valley south of the Arch, a location which because of its low position did not seem suitable to the founding of an ancient town. Eventually archaeologists found out that a pre-Roman fortified shrine stood on one of the hills and that the town was built at its foot. It is possible that the first inhabitants lived near the shrine. 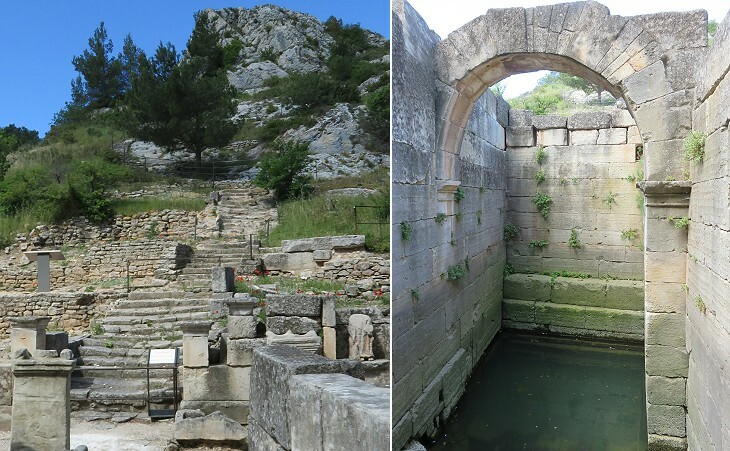 Archaeologists have identified three periods of the development of the town: Glanum I, when it was an entirely Gallic settlement; Glanum II, when it acquired some Hellenistic features (IIIrd/IInd centuries BC); Glanum III, the Roman town (Ist century BC-IIIrd century AD). Cornelius Scipio (during the Second Punic War) set sail with sixty warships and coasted along by the shores of Etruria and Liguria, and from there past the mountains of the Salyes until he reached Marseilles. Here he disembarked his troops at the first mouth of the Rhone to which he came. Livy - Book XXI - Translation by Rev. Canon Roberts. 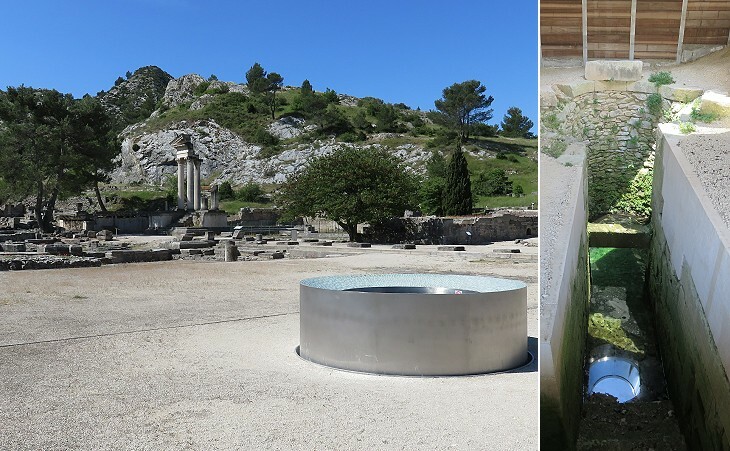 Glanum was inhabited by the Salyes (or Salluvii); Pliny the Elder in his Natural History mentions Glanum Livii, but most likely he should have written Glanum Salluvii. 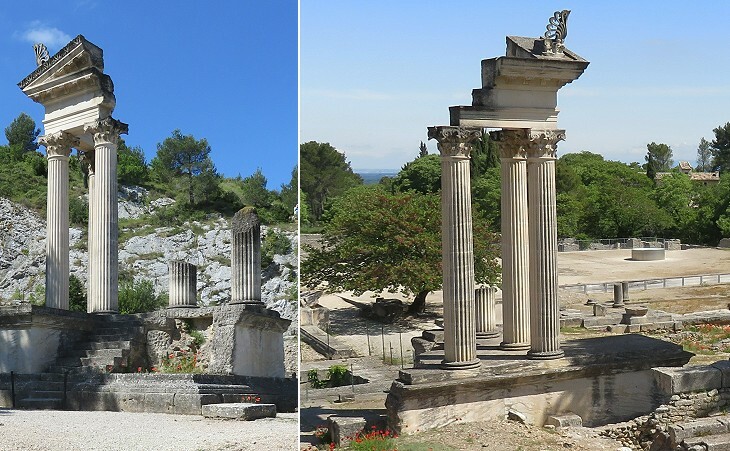 It was situated at the sides of a road which from the coastal region led across a low ridge of limestone mountains (today's Alpilles) to a fertile plain (today's Comtat Venaissin or Département de Vaucluse) to the east of the River Rhône. The Salyes developed trade with the merchants of Marseille and they were introduced by them to the use of the Greek alphabet and to some elements of their civilization. The economy of the town was mainly based on the shrine and on a spring which had healing powers. 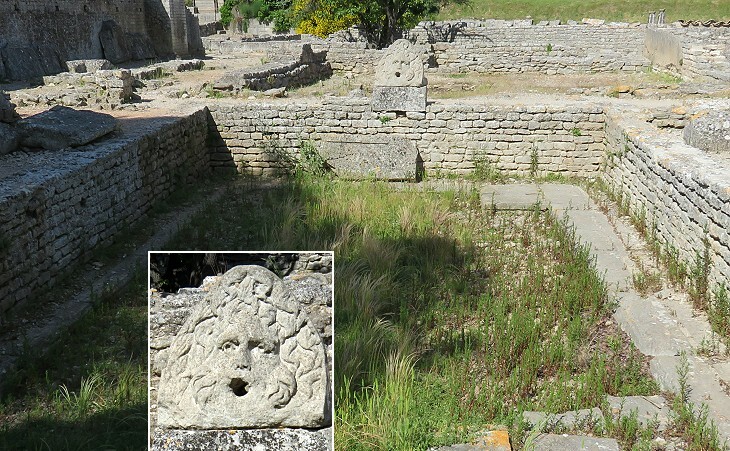 The name of the town (Glanon in Greek and Glanum in Latin) is most likely a corruption of the Gallic deity of the shrine. Heracles/Hercules was a Greek hero/demigod who performed most of his Twelve Labours in his homeland, but by and large it can be said that he was worshipped more in the western part of the Roman Empire than in Greece. According to the myth in his tenth labour he travelled to Spain or to Morocco and he went back to Greece with the cattle he stole to Geryon, an evil giant. The Romans claimed that on his way home he stopped at Rome and they associated their city with the hero by erecting many temples to him. The same did many Roman towns in Spain e.g. Zaragoza and even in Algeria, so it is possible that during the Roman rule also the inhabitants of Glanum claimed that he visited their town. A very interesting inscription shows the integration between local and Roman beliefs. M. Licinius Verecundus, who served in Legio XXI Rapax dedicated an altar to Glan and to Fortuna Redux, a Roman goddess who protected the return from a journey (or a military campaign). She is first mentioned in association with the return to Rome of Emperor Augustus from a travel to the East in 19 BC. The inscription refers also to the "Mothers of Glan", most likely a variant of the cult of the Three Mothers, three ancestral goddesses of fertility (see a relief depicting them at Lyon). Most likely Licinius Verecundus served in Legio XXI Rapax during the campaigns of Germanicus in 13-17 AD beyond the River Rhine. 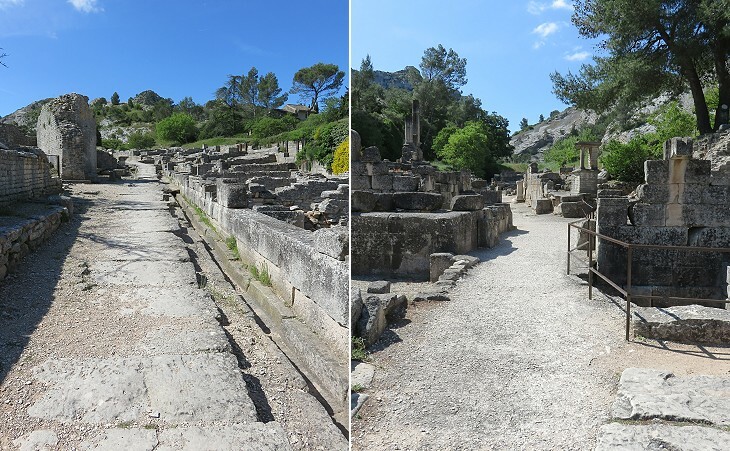 In the IInd century BC Glanum experienced a period of development and it was enriched with facilities which were typical of a Greek town, e.g. a bouleuterion (see that at Priene), where the elder gathered to decide on matters related to the government of the town. The access to Glanum from the coast was protected by a bastion which was eventually turned into the official southern limit of the town, the northern one being marked by the Arch. In the late IInd century BC the Romans established their rule on Southern France; some local tribes did not oppose their hegemony and they were allowed to retain their institutions and some degree of independence. The conquest of the rest of Gaul by Julius Caesar was achieved with the help of some these allied tribes. The Mausoleum of the Julii, testifies to this alliance; it was erected to celebrate a local commander who supported Caesar and was eventually granted Roman citizenship; he chose to abandon his original name and adopt that of his patron. 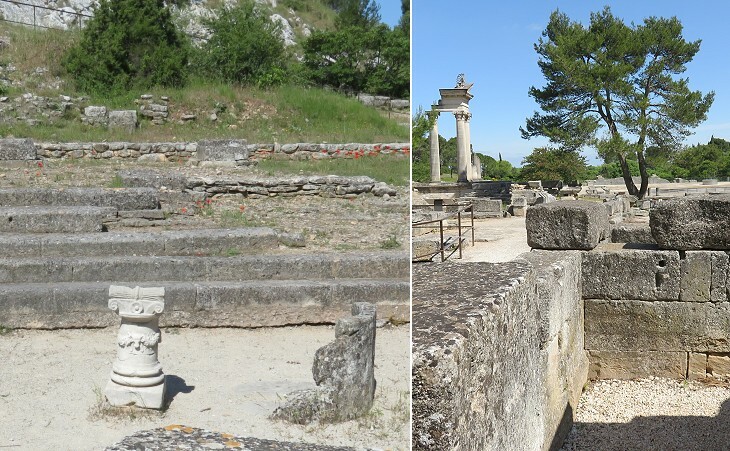 Glanum gradually acquired the aspect and the institutions of a Roman town. Rome was ruled by a Senate of a hundred members; they held their meetings in the Curia or inside a Temple, not in an open space such as a bouleuterion. All provincial towns over time had their own small Senate, the members of which were responsible for the administration of the town and for tax collection. 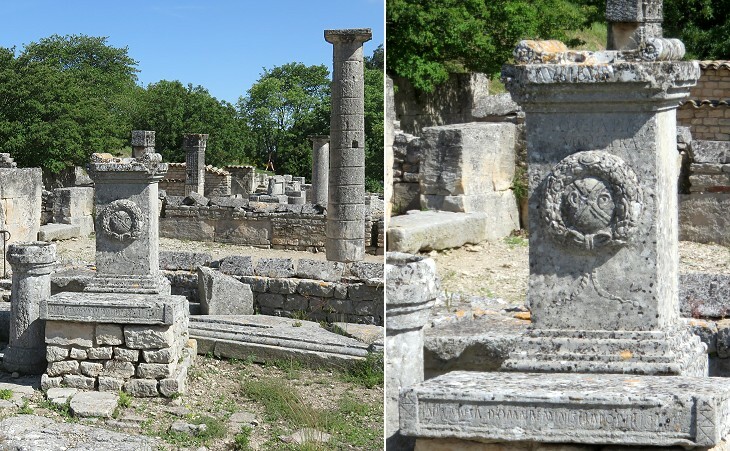 Those of Glanum had their own Curia near the Forum. The building was most likely utilized also for other aspects of the administration of the town. When Octavian became Emperor Augustus he realized that the Roman rule could not be enforced only by the sword. The active support of the wealthiest citizens of the provinces was asked to pass some positive messages about the Emperor and Rome to the whole society. Officers were appointed to hold celebrations of the deeds of the Emperor and of the main events of the history of Rome. Temples to Rome and Augustus were built in many provincial towns, including Vienne. The two small temples (one of which partially reconstructed) near the Forum were most likely dedicated to Augustus or to the three Capitoline Gods (Jupiter, Juno and Minerva), a symbol of Rome. 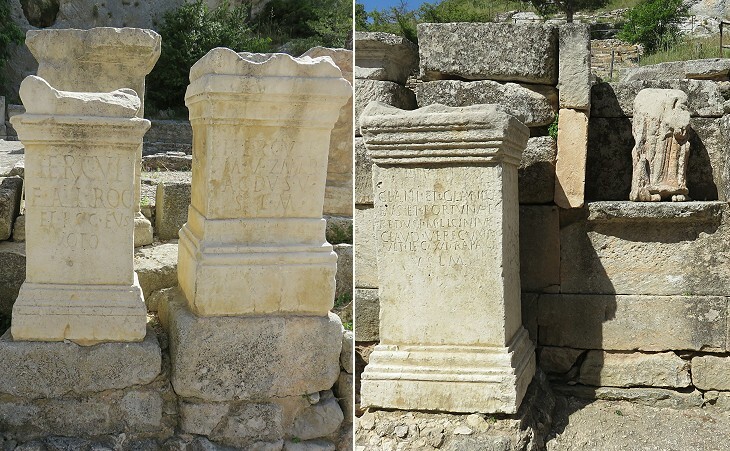 Twin temples of the Augustan age were built at Pola in Istria, whereas a Capitolium made up of three temples survives at Sufetula in Tunisia. The inscription helped archaeologists in assessing the importance of Glanum during the Roman rule because it mentions a very important member of the imperial family, the son-in-law of Augustus. He promoted the reconstruction of a temple associated with the shrine and its healing powers. The dedication to Valetudo, the name the Romans used for Hygeia, the Greek goddess of health, is an indication of the Romanization of the region and of Latin supplanting Greek and the local language. The altar is very similar to one found at Arles in which the name of the priestess is preced by the words Bona Dea, a very elusive ancestral Roman goddess. The ears are thought to indicate that the goddess listened to the prayers of her worshippers. It is regarded as another example of integration between local and Roman or Greek cults. 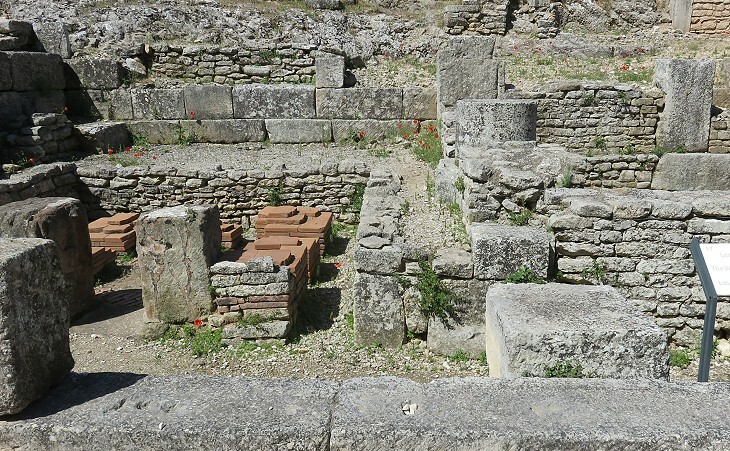 Bath establishments were a must for a provincial town which wanted to have a Roman allure. Travellers would have negatively rated and perhaps avoided a town without this facility where they could relax and exercise. 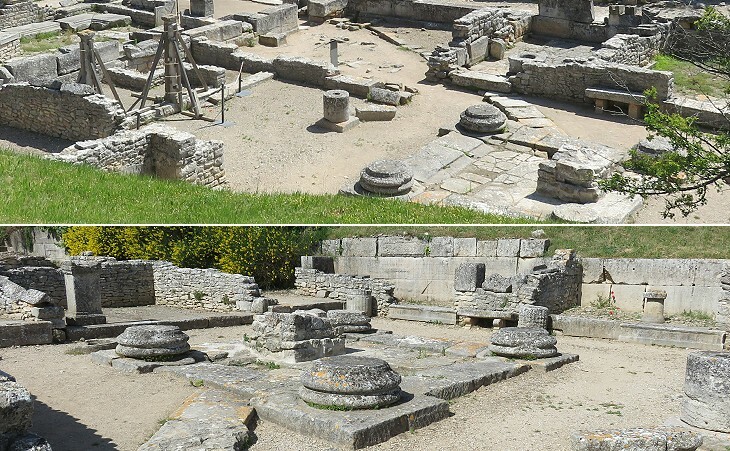 The bath establishment found at Glanum (most likely not the only one) was strategically placed along the main street and near the northern entrance to the town. It is dated Ist century BC. Usually baths rewarded archaeologists with statues, marbles and mosaics, but the yield at Glanum was rather limited. Based on archaeological evidence the town was not very prosperous already in the IInd century AD and it was most likely almost abandoned after having pillaged in the 260s, during a period of unrest and raids by German tribes. It was eventually covered by a landslide at an unknown time. This house was built in the IInd century BC, but it was utilized and partially redesigned until the IIIrd century AD. It was structured around courtyards and basins for collecting rainwater, a layout which was typical of Greek and Roman houses in countries which had a more pronounced Mediterranean climate, than Southern France. 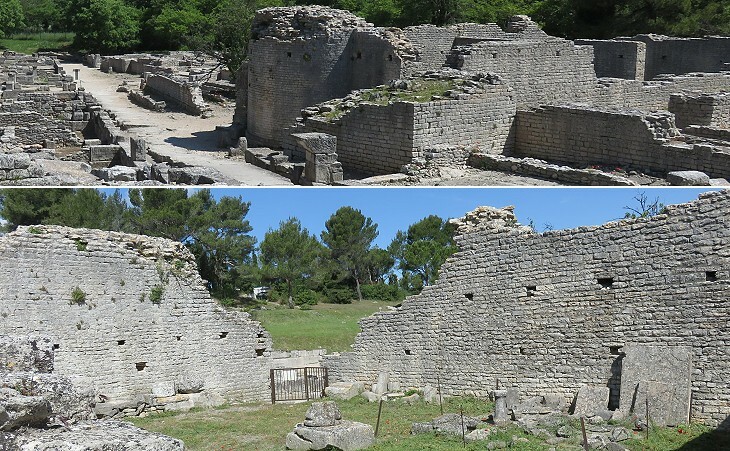 This layout became a mark of distinction for the wealthiest inhabitants of Gaul who wanted to exhibit their degree of Hellenization or Romanization (see the House of the Oceanus Gods at Saint-Romain-en-Gal). 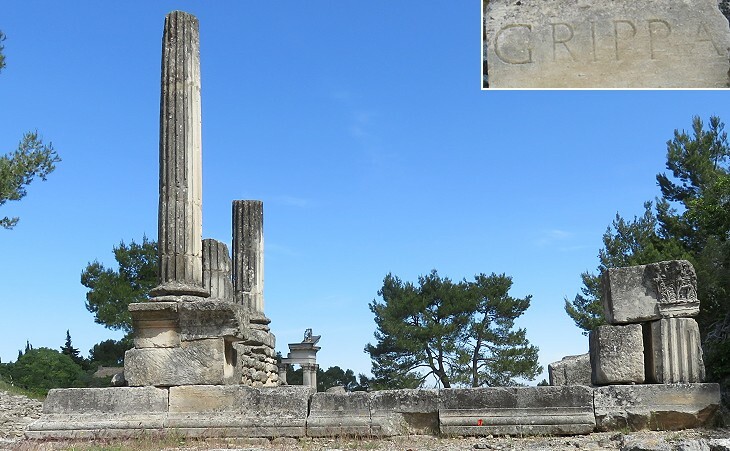 Similar to the House of Atys that of the Pilasters shows the changes in style and fashion which occurred at Glanum. The plain columns of the peristyle are dated late IInd century BC or early Ist century BC, whereas the elaborate pilasters are an addition of the time of Augustus, as well as other details of the decoration. We know from Pliny and other ancient writers that the wines of Gaul were treated to improve their conservation. 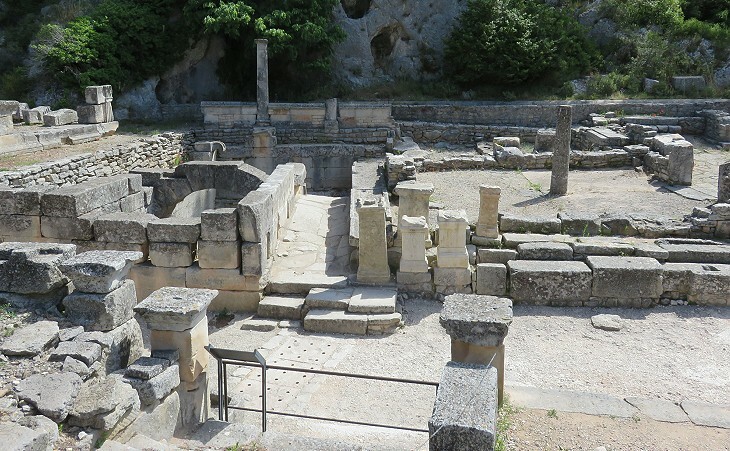 At Glanum archaeologists found evidence of the spaces where vessels of wine were exposed to smoke. The details of the process and its actual results are yet to be fully understood. Attempts to recreate it did not bring satisfactory results as they led to a substantial decrease of the alcoholic grade of the wine. Return to The Arch and the Mausoleum of the Julii.